Vice President Mike Pence listens in the Vice President's Ceremonial Office on the White House complex in Washington, during a meeting with family members of the six Citgo executives currently detained in Venezuela, April 2, 2019. Venezuelan opposition leader Juan Guaido, whom many nations have recognized as the country's rightful interim ruler, greets supporters during a rally in Los Teques, Venezuela, March 30, 2019. 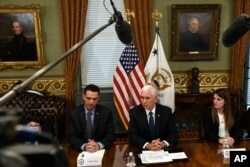 Vice President Mike Pence, center, sitting next to Carlos Anez, left, and Veronica Vadell Weggeman, right, speaks during a meeting in the Vice President's Ceremonial Office on the White House complex in Washington, with family members of the six Citgo executives currently detained in Venezuela, April 2, 2019. Pence said the men had been "illegally detained" and that 16 court hearings had been canceled as the men languished in basement cells without enough food or medical treatment. He said the Trump administration was working for the prisoners' release.